In this paper, LiNO3–NaCl binary mixed molten salt with high phase change enthalpy was selected as phase change materials (PCM). LiNO3 was used as the main phase change material, and NaCl was used as the additional material to change the properties and reduce the supercooling degree of molten salts. LiNO3–NaCl binary mixed molten salts with different mass proportion were prepared by static melting method. The optimum eutectic ratio of the mixed molten salt was obtained through analysis of the experiment results. 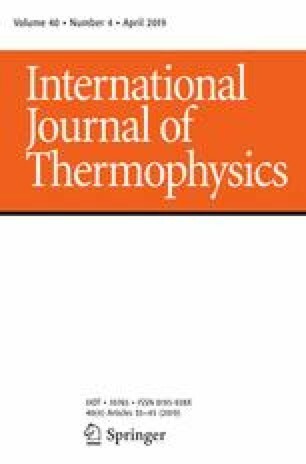 The influence of NaCl on phase change temperature, decomposition temperature, supercooling degree and phase change latent heat were tested and analyzed. The properties of the phase change materials were characterized by thermogravimetric analyzer and simultaneous differential scanning calorimeter (TGA/DSC), scanning electron microscopy (SEM) and X-ray diffraction (XRD). The phase transition temperature, latent heat and supercooling degree of the binary mixed molten salts showed nonlinear variation with the increase in NaCl mass fraction. When the mass ratio was 88:12 for LiNO3–NaCl, the phase change temperature was the lowest of 222.6 °C, the phase change latent heat was the highest of 389.3 J·g−1 and the supercooling degree was 1.2 °C. The optimum eutectic crystallization degree was achieved. At the same time, the decomposition temperature of the mixed molten salt was increased from 560 °C to 620 °C with the addition of NaCl, which greatly increased the applicable temperature range of LiNO3. This research is supported by Shanghai Science and Technology Committee Project (Contract No. 18020501000) and National Natural Science Foundation of China (Contract No. 51576119).